President Trump called for Congress to “choose greatness” for the country in Tuesday’s State of the Union address. He highlighted the many victories achieved by his administration in the past two years and laid out a vision for the future. Heritage has long supported many of these proposals: a national ban on late-term abortion, continuing to rebuild the military, and robust border security. One issue the president failed to address is the nation’s ballooning debt, which stands at $22 trillion amounting to $68,000 for every man, woman, and child in America. Spending is a bipartisan problem. What is your take on the State of the Union? The entry of illegal aliens into the U.S. must be stopped. When this is done the drain they cause on our economy will be reduced. In addition every expense item in the national budget needs to be reviewed with thought of elimination or reduction. Retired CPA’s and business managers should be employed to do the review to prevent as much political influence as possible. This was the Best Ever State of the Union speech I have ever heard and I am 76 yrs old so I’ve seen many. Mr. Trump makes me Proud to be an American again. He addressed so many topics that I care about, the borders, late-term abortion (I live in New York, yuk), the legalization of marijuana (even the State Police don’t want it because of a potential increase in impaired accidents, affordable health care, veterans concerns, etc. There were so many things he has already acted on that will help the citizens and I pray he will continue to be safe and expose all the government corruption and clean house on our Justice System and clean up our voting laws to demand proper identification. The President gave a very good speech, however he did not discuss very important topic, the national debt and out of control spending. I would like to see a balance budget amendment passed. I think our president was emphasizing bipartisanship over all, and skipped over the issues that aren’t on his immediate agenda. Right now the country needs to secure the border, fight infanticide, etc. We always need to cut the budget, and I’m sure the emphasis will be there at another time. We have the right president but the wrong congress. We have the government that our founding fathers warned us about. Applauded at the conclusion, it was beautifully written and spoken with depth of emotionand heartfelt sentiment. I felt proud to be an American. I wish I had a flag to wave or fly in the night sky. I select greatness. I select and demand a wall now! The lack of even the recognition of our national debt is a disgrace shared by the Republican party. Glad to see that Heritage plans to address this problem as [I hope] the number one priority facing our Nation. I just want to comment on the immigration issue. I have not heard one conservative pundit point out that without a wall every illegal immigrant will be able to get into the country no matter if there are drones and cameras. The way the system is working now, once they are taken into custody they are released into the population to wait for adjudication, which most do not show up to. If you look at some of the video taken of them climbing the fence they just stand there and wait to be apprehended. They know what to do. I thought the speech was well written and delivered. I thought it was brilliant how he managed to have the democrats stand up and cheer. I also thought it was clever to show how they(democrats) don’t really don’t support stopping illegal immigration. I’m hoping the President and Conservatives in congress take on cutting spending by uncovering fraud and waste. I thought Trump’s state of the union message was superb, both content and delivery. I could not imagine any sensible American not being moved and encouraged. Mistakenly, I now realize, I included the radical democrats! Trump is a good public speaker. And he’s very good at communicating with voters. Rather than criticize him for omitting any mention of the ridiculous debt, let’s begin with basic economics, so the voters are able to understand us. Most importantly, the silly practice of beginning with last year’s budget IS NOT WORKING and never will! Each and every line item should start with zero dollars. Before any dollar amount is even considered, it should be determined whether there is any need to keep the item or service. This is the first chance to CUT THE BUDGET. Only if it’s deemed necessary should any money be allocated. Next, begin with no more than 50% of the previous year’s figure, and add only if absolutely justified. Never submit a budget that exceeds last year’s. Never! One of his best speeches to date! Sad so many Americans have forgotten.. or never knew what it really means to be An American. I fear for our future when President Trump leaves office. I agree with Heritage and had the same take on the President’s State of the Union address. I feel that the greatest problem of our nation is the horrendous rate of spending. The State of the Union speech was well executed. But in all honesty, like all SOTU speeches it is carefully calculated political theater. Was the SOTU a good speech? Yes, it was. Will the SOTU speech result in a greater degree of action on the outstanding matters facing Congress? Of course not. 1) Judicial nominees confirmed – ALL of them, NOW. That is in the Senate’s lap to perform – no-one else’s. If we get to 2020 and still have nearly 150 judicial vacancies like we do now, expect a Senate flip. The people of the United States will generally not vote for incumbents who fail to perform. 2) A wall. Not a berm, not a fake barrier – a real wall across California’s southern border at minimum. 3) An emergency proclamation from the President on the wall. We all know Congress won’t give the President what he needs to get the job done. So yes, use of emergency powers is not only appropriate, it is now absolutely necessary. 4) Re-evaluate the budget, once it gets passed. Why? We are running at an insane level of budget deficit and debt is rather high. Entitlement review has been requested even by SSA staff. Our budgeting scenario is grim for what could happen a few years from now. We ultimately need to reduce spending. Yes, the Senate has been confirming them – But NOT FAST ENOUGH, even though it is true that the rate of confirmations has increased – even though that is true, the U.S. Senate is still behind. In November 2016 there were 95 federal judicial vacancies in the USA. By Feb 2017, 117 vacancies. There are now in February 2019, 148 judicial vacancies with only 53 nominees pending. ONE HUNDRED FORTY EIGHT VACANCIES WITH THE NUMBER OF VACANCIES GROWING! Not only does this affect 2nd Amendment cases, but also, any cases – most cases cannot advance in this climate. SOME AMERICANS. HAVE BEEN WAITING NEARLY 5000 DAYS JUST FOR THE SENATE TO CONFIRM A NOMINEE FOR A VACANCY – THEN ONCE THAT HAPPENS THESE PEOPLE WILL STILL HAVE TO WAIT FOR YEARS TO GET THEIR CASE HEARD. That is a failure of the U.S. Senate that transcends administrations. Nearly five thousand days for some judicial vacancies! And counting. There are currently 73 judicial emergencies in the U.S.A. of those nearly 150 vacancies! How is the conservative agenda being advanced if CASES CANNOT EVEN BE HEARD BY A JUDGE? The answer: it isn’t. California and New York are being given free rein to practice their unconstitutional laws. Cases to challenge and overturn unconstitutional law languish in the court system! Bypass Feinstein s the Senate did recently with the 9th Circuit nominees! We don’t need Feinstein’s permission to put judges on the bench and frankly Feinstein and Harris are just slowing the process. So bypass them. No more blue slip treatment of judicial nominees. While we, the American people, call upon the Senate to act, we ask you, readers, to call upon the President, to demand that he make the remaining 96 nominations now, in 2019, as soon as possible! We elected him so he could pack the courts with strong, Constitutional originalist and Constitutional conservative judges who will respect the Constitution, take up 2nd Amendment cases and defend our country’s rights. WHY ASK THE PRESIDENT TO USE EMERGENCY POWERS FOR A WALL? You know why. During the first two years of President Trump’s time in office, Congress did not work hard enough to give him a real budget without compromising on immigration. Now in 2019, no progress is coming from the House on the issue. After all this disagreement and shutdown, all the House will give is 1.6 billion – not for a wall but with part of it for what is a “berm” or “flood control” and the rest for “border security,” or should I say, lack of border security. Yes, the President should declare an emergency on the wall even if Congress passes the nothingburger it is contemplating. So Congress is incapable of giving us sufficient funding for the wall, and border issues continue unmitigated with hundreds if not thousands of illegal immigrants daily. The cartels, gangs etc. exploit this, which results in drugs, slavery and abuse of children whose parents send them into harm’s way as part of illegal border crossings. Thus the President should use his emergency authority. It should not have to happen, but now it is necessary due to the situation at the border and the refusal of Congress to do its job. 10 U.S.C. § 2803 (Section 2803) provides that the secretary of Defense ‘may carry out a military construction project not otherwise authorized by law’ upon determining that (1) ‘the project is vital to the national security or to the protection of health, safety, or the quality of the environment,’ and (2) ‘the requirement for the project is so urgent that’ deferring the project ‘would be inconsistent with national security or the protection of health, safety, or environmental quality. (a) Termination or deferment of civil works projects; application of resources to national defense projects in the event of a declaration by the President of a national emergency. The American People have waited long enough. President Trump gave a powerful and truly great speech. I appreciated every word. He conducted himself like the leader that God placed at America’s helm. I trust him to do what he says. I was an excellent speech. Rush called the SOTU “A Symphony”, and I agree. The two adults in our household liked the State of the Union speech pretty much. Personally, I believe mistakes have been made in the past by taking on too much at one time, and that the spending issue will come under this administrations plans when the timing is favorable. Let’s hope we are able to get another term with this very able president. Best crafted and comprehensive state of the union speeches in my 50+ year history of listening and watching. I used to go to Mexico, Juarez and Los Mochis, both now impacted by drug trafficking. I had great times in both. It is imperative to get drug trafficking under control to the betterment of both our countries. I understand the El Paso wall and the crack down on the Sinaloa Cartel has helped both cities. I hope both our countries continue to co-operate on our mutual problems. I was positively impressed by Trumps speech, his grasp of numbers and his ability to speak without notes or a monitor as Obama used. I think the state of the unit is fantastic and if it were not for the Democrat’s and the ill informed persons who elect them, it would be super fantastic. There would be no more sanctuary cities, we would build the wall and stop assassinating the new born, and appreciate capitalism and law enforcement. I thought it was a classic statesman’s address by a president who truly cares for America and its people. He has demonstrated his objectives to be above the petty partisan politics of the other party (and many in his own party). I was duly impressed, a very Presidential State of the Union. He rose to the occasion and surprised many. I thlught the presentation was insightful, meaningful, and very Presidential. Hoorah for all the accomplishments while acting under continuous raucus and cruel fake news and insults. Nancy, OTOH was obviously looking for something — who knows what — in continually shuffling papers in full view of the camera. I believe she was consciously asserting “powerr” by continuing to stand after everyone else sat down and Trump began speaking. Very sophomoric. It was a very good speech and was a valiant attempt to invite accommodation where we can agree as a people. It could have been all encompassing had it acknowledged a looming debt problem that will not remain ignored for much longer and if not dealt with, will exact a terrible lesson. The State Of The Union speech was terrific. Trump seemed more at ease than he did with his TV address to the nation. This country is on the right path. Why would anybody want to destroy success? Oh wait that would be power hungry Democrats. Their New Green Deal is a disaster!!!!! On the whole, I thought there was no way to improve on what the Donald said. I am legally deaf, and could hear every word. I do fear for the future of our nation without a reduction in the national debt. The State of the Union was very entertaining Not only did the president make the Dems gag, choke and roll their eyes, It was a real treat watching Polosi trying to orchestrate what they should do next. The new Dems didn’t know if they should clap, boo, or do the hokey pokey. I think the President gave a wonderful address. I was disappointed in those Democrat women wearing white and acting like spoiled children. Pelosi seemed to direct those women lifting her hands like telling them to stand up when the Prsedent mentioned more woman were in Congress. When they did stand it was as if they were cheering strictly for themselves. We need to secure our borders, build that wall. We need to get our debt in control. We need not to be killing our new born babies. Thank you President Trump for loving our country and caring for us citizens. Our country needs to follow our Constitution! So Proud of My President…It was everything and yet more…A Vision, Historical, well Presented to All of America, not one Person was left out …and that is remarkable …it was well accepted because it was in laymans terms and spoke to the Hearts of Man … He spoke of the past , the now, and the future…Greatness at its best…the speech captured Kindness and in the same breath Love of Country…In My Opinion the Speech is Unforgetable! The address was fantastic. I was so proud of our president. He addressed as many major issues as he felt necessary . His delivery was professional. The invited guests were an act of genius on his part and surely helped to put his belief in our country needing security at the border. It bothers me that Polosi has put a value of $1.00 on the safety of the American people and a value of 0 upon the lives of babies in the womb and just born. It would seem that the American people mean very little to her. I wonder what will happen when the mass of illegal wanna-bees decide that since they outnumber the officers on the border they can storm it and overpower the officers. How will we react? Who and how many will be hurt? Will Nancy be there to scare them back across the border? I thought Trump did a masterful job of delivering the truth. Lots of Democrats don’t want to hear it. I thought it was a great speech. Like you he did not address the 20 trillion debt. The purpose and scope of SOTU lies within its title. POTUS is supposed to size-up the situation, explain what was accomplished the prior year, and present the issues that require urgent change in the current year. POTUS covered what must be done at once. Others had to wait for another day. Examples are the national debt, entitlements, Organized labor abuse, reform of tort law, runaway executive compensation of publicly-held corporations, and an affordable judicial system. Trump did not want to give the Dems a bigger shooting target than necessary. He also did not want to telegraph his punches for the world to notice. I loved the whole SOTU speech it was definitely a beautifully written and American valued speech. I also think that the dimms keep showing how they really feel about America, Americans, ethic, values and Christians. Its scary to think that they are making laws for “We the people ” that they think they don’t have to abide by. The only thing WE have is the President…if not for him…this county would be as bad off as Venezuela! WE are blessed President TRUMP is our President. President Trump did an excellent job of delivering an excellent speech. Too bad the Democrats weren’t swayed, but we all knew they wouldn’t be. Great speech! Heartfelt and inspiring. Love President Trump’s patriotic message. So glad he has the courage to stand up for America first. The liberals must never be allowed to succeed in ruining our great country. Godspeed President Trump!! That was an excellent State of the Union speech! In particular, I want to commend those who put together the “flow” of the speech as it moved from one topic to another. It was a patriotic and at times, an emotional speech. I was most concerned that the message would resonate with the “independents” who will determine the 2020 election. I think it was successful in this regard. I note that the CBS (not FOX) flash poll afterwards gave President Trump a 76% approval. That’s fantastic news and it gives me confidence that he can win reelection in 2020. The State of the Union address was a powerful message to the American people. Don’t take a robust economy, a growth in oil and gas production as non-important. He failed to address sciences. The new generation 4 Thorium reactors and rare earths are security problems. Both congress and the president know this yet have failed to move on them. China has said they will dominate the world with these. They are moving in that direction. We are almost past time to act. 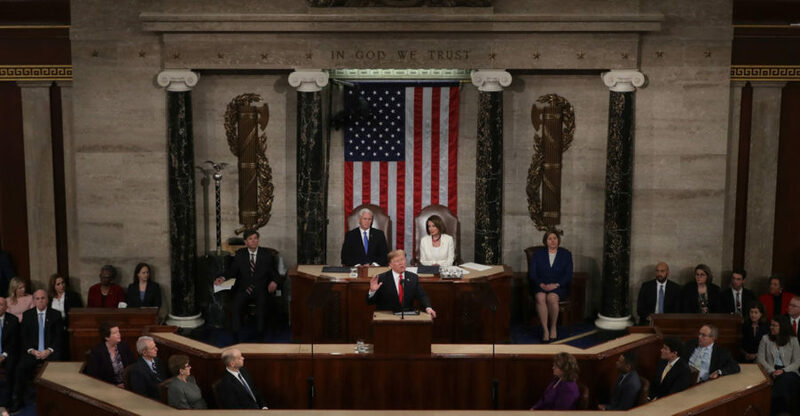 Pres, Donald Trump’s State of The Union message was encompassing and through to the point. It was becoming of the U.S. of A., being well thought out and delivered flawlessly. It, and he, deserves congratulations. Very well done. On abortion- when a baby is conceived in the womb God gives it a Soul which makes it a human being. To abort the child whether at day one, 3 months, 5 or 9 months is murder and a mortal sin. These are the true facts. The Supreme Court was wrong in allowing this. The Governor of Va. was wrong and he’s supposed to be a Doctor? Should lose his license! President Trump is the best president! Sincerely, Kathleen Moravsik, RN, Traditional Roman Catholic. Best speech ever!! Great President!! Right President. Government our founding fathers warned us about. Whats up with congress?, none of them up there seem any good. Cant seem to get anything done. This message is for Kay Coles James. I am asking that the Heritage Foundation and people on your staff keep the promise of President Trump’s at the forefront of his agenda. Put up the wall at the end of this three week period in February. Don’t cave in to people who are grossly ignorant and outspoken. There is no compromise on the border wall. There are thousands if not millions of American citizens who want the wall. Nancy Pelosi and the others will take no end of taxpayer funds to argue it to death. Please do not let that happen. Excellent, a “Presidential” speech AND delivery. And now: National Debt Attack! I was proud of our President and horrifically appalled by the blatant disrespect of Congress members, male and female! PRESIDENT TRUMP WAS UP THERE WITH PRESIDENT REAGAN. THESE ARE THE TWO BEST I HAVE HEARD IN MY LIFE TIME AND I AM 81 YRS OLD. BOTH PRESIDENTS HAVE EXCEPTIONAL COMMUNICATION SKILLS, EACH WITH THEIR OWN STYLE AND EACH ARE EXTREMELY EFFECTIVE. I thank God for our president. He owes no one a debt for campaign donations! That frees him to take care of the US! We thought the speech was a home run! But it wouldn’t hurt to mention the national debt. I believe he is going to address that as soon as the current “fires” are taken care of. We need border security!!! The most important item our great President brought to the forefront is American Exceptionalism. This is what is totally lacking from not only our youth under the age of 40, but even seasoned adults who have gone off the rails. Highlighting who we are— from our founding, through WWII and up to today, his message was more about our fight for freedom, rather than a laundry list of successes verses omissions. This may have gone over the heads of some critics, but once again, he has connected with the heart of America with a true sense of purpose. We the People, get it. He was stellar—-historic speech. It was his turning point, for those who watched with dubious hearts. The Democrat party is going to split and devour each other, and our brilliant DJT will be successful in 2020 because of their vision of doomsday. INVASION and destroy our Nation ! Please tell President Trump that his speech was great, right on target! Also the Wall is the most important thing.